1 a.m. KILSYTH. Kilsyth Foodbank, Unit 1, Parkfoot Road, G65 9AB. 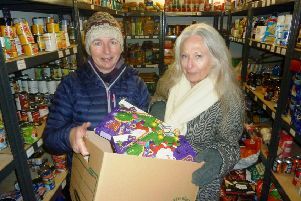 (accessed via path next to Masonic hall) Pictures of volunteers, shelves and food parcels for feature on local food banks. This is outside normal collection times but avoid photographing any service users. Contact Lesley Dickinson, 07956754206. The Right to Food should be enshrined in law according to South Scotland Labour MSP and Scottish Labour Shadow Cabinet Secretary for Rural Economy, Connectivity and Transport Colin Smyth. Speaking during a debate in the Scottish Parliament Mr Smyth argued that enshrining the Right to Food into law would change how public bodies tackle food poverty. In the previous financial year (2017/2018) the Trussell Trust distributed over 300 emergency food parcels in the Scottish Borders – 73 of these were for children, providing 990 days of food for people in the Borders. Colin put forward a motion calling on the Scottish Government to bring forward its much talked about Good Food Nation Bill. Speaking after the debate Mr Smyth said: “The scandal of food poverty is one that affects too many people living here in the Borders. “Figures from the Trussell Trust show that over 300 emergency food parcels were distributed to people here in the Borders but this is only part of the story. “I am delighted to see that my motion which called for the Right to Food to be enshrined in law was passed unanimously by MSP’s in the Scottish Parliament.